Sunk Cost - What Does It Mean? What is a "sunk cost"? What is the definition of a "sunk cost"? 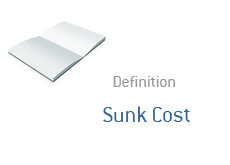 What does the term "sunk cost" mean? "Sunk cost" is a business term that refers to a cost that has been spent and can not be recovered. Example 1: A company decides to spend $30,000,000 building a new warehouse. After spending $15 million on the construction of the new warehouse, the real estate market in the area begins to tank due to a very weak economy. A warehouse, with similar specs to the one that the company is currently building, is listed at a price of $10 million. The company has "sunk costs" of $15 million (this amount can't be recovered, as the new warehouse is incomplete and can't be sold). From an economic standpoint, the smart decision would be for the company to abandon the construction of their new warehouse and buy the one that is being listed for $10 million. However, sunk costs usually incur a form of "emotional investment", and many people have a hard time walking away from something once they have incurred costs that can not be recovered. Example 2: A young entrepreneur decides to build a web site that will automatically scan multiple online insurance sites to find the lowest possible insurance quotes. He allocates a budget of $50,000 for the project. After spending a total of $40,000, the project is nowhere close to being completed and the site is completely inoperable. It becomes apparent to the entrepreneur that he will have to spend MUCH more money to complete the project - more money than he has. He has a total of $40,000 in sunk costs - this money can not be recovered, as the site is in no condition to be sold. The entrepreneur has two options - walk away with the project, taking a total loss of $40,000, or try to find more money elsewhere. Human beings tend to be very adverse to taking losses, which is why it is so hard for people to walk away from something once they have incurred sunk costs, even if it is the right decision.